The first step in planning a move is to consider your moving options and decide on the method that will best meet your needs. Aside from hauling all your belongings in the back of a pick-up truck, three main options exist for moving. ​Each of these moving options offers advantages and disadvantages. The more you can learn about the available choices, the easier it will be to make the best decision for your move. You rent a container (or containers) from the storage company. The company delivers the container to your location. The company picks up the container and moves it to your new location or, in some cases, to a storage facility. Nationwide there are several companies offering this service. The scope of services offered varies depending on the company you hire. Some allow you to load the container at your leisure, charging you by the month for rental. Others limit the loading period to a few days. While it may be more convenient to load things gradually, the longer the container is on site, the more expensive the service. In addition to moving services, some storage container companies have temperature controlled facilities where you can rent storage space for your container. This is nice if you know you are not going to be able to get right into your new home once you arrive at your new location. Affordability – This can be the most economical of the moving options, particularly if you keep loading time to a minimum and your containers are going door to door. Security – When you use a portable storage container, the only person who has access to your stuff is you. You place your own lock on the container so you’re the only one who can open it. Convenience – There are so many other things to worry about when you are moving, it’s nice to leave the actual transport of your goods to someone else. Control - When you rent a moving truck there is always a crunch to get it back in time. This option gives you more freedom when it comes to loading and unloading your stuff. Safety for you – Portable containers sit flush with the ground so you don’t have to worry about people tripping up and down narrow ramps carrying heavy loads. Safety for your stuff – With a storage container your stuff only gets handled once as it is placed in the container and then again when it is removed. Moving companies often offload shipments to storage facilities temporarily or transfer them to another truck. The more often items are moved, the more likely they will get damaged or disappear. Legal Restrictions - Check with the city and your homeowner’s association (if applicable). You may need a permit to park a large container in your driveway for an extended period of time. In addition, there may be limits as to the amount of time it can remain on the premises. Violation of these requirements can lead to costly fines and added stress. Compounding Costs - Beware of compounding costs. Whenever you pack yourself you have to factor in the cost of supplies – packing materials and other moving equipment (such as hand trucks and dollies). In addition to these inherent costs, you have the possibility of piling up unplanned fees for such things as keeping the container on site or transporting the container to a new location (such as the company’s storage facility). While it may be nice to take your time loading a portable storage container, the cost of convenience can quickly add up. Potential Risks - Consider the possible risks of placing a large box of your belongings in your front yard. While the risk may be minimal depending on where you live, a portable storage container has the potential to attract vandals or thieves who may see it as an easy target. Affordability – Generally speaking you can expect to save hundreds of dollars moving yourself as opposed to hiring a moving company. Convenience – Because of the widespread nature of truck rental companies most people will have no problem finding a rental company within a reasonable distance on either end of a move. This may not be true when it comes to portable storage containers which are not as widely available. Variety – Moving trucks come in several sizes to accommodate different needs. Most even have a couple of different trailer options available for those moving without furniture. Flexibility – Assuming you give sufficient notice to the truck rental company so that they have the right size truck on hand, you should be able to move at your convenience. When hiring a moving company, you are often subject to their schedule, particularly during the peak moving season (May – August). While the option to rent a moving truck is a great one, there are some potential negatives. 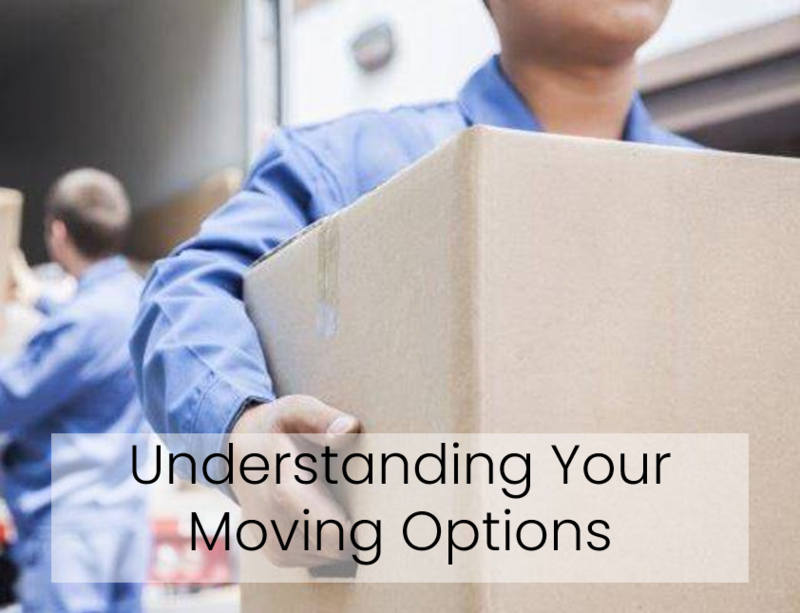 Consider the following when comparing your moving options. Additional Costs - In addition to the cost of your truck rental, you will no doubt need to purchase packing materials of some sort. You may also need to purchase or rent moving supplies such as hand trucks, moving blankets and straps, etc. In addition, you will need to have some sort of insurance, either through the moving company or through a private company. On top of that, you have the added cost of gasoline. Moving trucks generally get less than 12 miles to the gallon, so depending on the distance you have to travel this could be a big expense. Physical and Emotional Stress - Because moving is so stressful, its important to think about the cost in mental and physical well-being associated with each of the available moving options. Truck rental represents the ultimate DIY move experience. You pack your stuff. You load your truck. You drive the truck to your new home. You unload the truck and unpack your stuff. It’s all you, and it’s exhausting. It can also be pretty stressful. This kind of move represents a huge drain on a person’s time and energy. Driving Concerns - When it comes to truck rental, do-it-yourself means driving yourself…and your big, cumbersome moving truck. For some this is a truly intimidating prospect. The fear factor aside, driving a moving truck often means the family is split up as you travel. That means paying to fuel not one, but two vehicles. On long distance moves that can really add up. If, instead, you opt to tow your car you can expect the already pathetic gas mileage of the moving truck to plummet even further. Experience – When you hire a moving company, part of what you’re paying for is their expertise, and most have an abundance of it. Despite the faded t-shirts and the scruffy haircuts movers are professionals. They know what they are doing when it comes to handling large, cumbersome pieces of furniture or packing delicate antiques and other valuables. In many cases your stuff is safer in their hands than it would be in your own. Convenience – Let’s face it, having someone else handle all the hard stuff (like packing, loading and transporting your belongings) leaves you free to focus your energy elsewhere. In addition, movers can do everything faster and more efficiently than you can yourself, so you save a ton of time (not to mention energy and stress) by hiring professional movers. Safety – Moving is backbreaking work, sometimes literally. More than one DIY-er has suffered a long term injury from heaving furniture and appliances onto a moving truck. Resources – As professionals, movers have all the cool gadgets and tools to make moving easier, safer and more efficient. All that gear is included in the price. When you move yourself you have to buy or rent it, adding to your overall cost. Relationships – When you hire professional movers you may not realize it but you are making an investment in the preservation of your closest relationships. When moving oneself the tendency is to call on one’s closest friends and family for assistance. This is understandable and reasonable. But moving is stressful, strenuous work which can temporarily put a strain on the best relationships. While moving a bulky dresser up a narrow flight of 1820’s era stairs at 11:00 at night when its 10 degrees outside is a great way to test the strength of a relationship, I can’t recommend it. And, yes, I have tried it. Replacement – When you pay professionals to move your stuff and something gets damaged, the company is liable to replace or repair the damaged item. Not so when you move yourself. If things get damaged, it’s all on you. Scheduling – Depending on the time of year, the number of professional movers in your area, and the size of the moving company you may be at the mercy of the moving company's schedule when it comes to setting the dates for your move. Handling – Logistical demands often force moving companies to make decisions regarding your shipment that you would never make yourself. The more frequently items are handled the more likely something will get damaged or go missing. In the interest of time and space companies will often co-mingle shipments. Co-mingling involves placing two separate shipments (going to different locations but in generally the same direction) on the same truck. This is done in order to ensure that a particular moving truck is full. Not only does this increase the risk that something will go missing from your shipment, it can significantly increase the amount of time it will take for you to get your stuff. It is also not uncommon for moving companies to offload a shipment temporarily in order to switch it to a different truck which may not have been available at the time the loading was scheduled once again increasing the risk of damage. Determining the Real Cost of a Move - This article by Jonathan Deesing offers a comparison of the costs between renting a moving truck and hiring professional movers. The author also suggests other factors to consider besides cost when choosing a moving option. Moving Glossary - This page offers an extensive list of moving terms which you may come across in the process of signing a moving contract. A great resource for making sure you understand what you are signing. Please note: The information featured here is the result of personal research and experience. It is of a generic nature and should not take precedence over information provided to you by specific moving companies with which you may be working. When comparing moving options, it is important to gather as much information as possible. As someone who has moved a great deal, I have experience working with professional movers and renting a moving truck. I have never rented a portable storage container, but I have researched them extensively. As a result, I would definitely consider this among my moving options for a future move for my own family, depending on the circumstance. I hope the information provided here will help you in making an informed decision about the best method for conducting your move and wish you the best in your moving adventure.